SAINT ANDREWS, N.B. — An already amazing season for Nova Scotia youth curling got even better on Saturday night at the W.C. O’Neill Arena Complex. 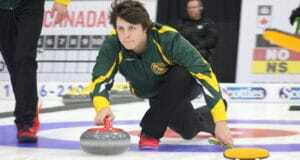 Alberta’s Ryan Jacques and Nova Scotia’s Graeme Weagle are through to the semifinals on the Boys’ side of the 2018 Under-18 Curling Championships, with Ontario’s Madelyn Warriner and Saskatchewan’s Skylar Ackerman moving on to the Girls’ semifinals on Saturday afternoon in St. Andrews, N.B. Carly Smith of Moncton, N.B., has been curling since she was six, and this week she’s competing at the 2018 Canadian Under-18 Boys and Girls Curling Championships in St. Andrews, playing third for Team New Brunswick (Host) team – a second provincial team added to the competition to even out the pools at seven each. The round robin wrapped up on Thursday night, and sixteen teams – eight boys’, eight girls’ – will now move on to the Championship double-knockout round of the 2018 Canadian Under-18 Curling Championships in St. Andrews, N.B. 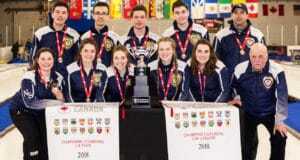 Quebec and Ontario women continue to roll undefeated through the round robin, with the 2017 champions from Northern Ontario dominating on the men’s side at the 2018 Canadian Under-18 Curling Championships in St. Andrews, N.B. All teams were in action on Tuesday at the 2018 Canadian Under-18 Boys and Girls Curling Championships in St. Andrews, N.B., with pool play underway to determine who will move on to the championship round later this week. Under-18 Canadian championships now underway in St. Andrews, N.B. The 2018 Canadian Boys and Girls Under-18 Curling Championships kicked off with the opening draw on Monday night in St. Andrews, N.B. 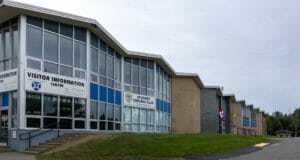 2018 U-18 Canadian Curling Championships begin Monday in Saint Andrews, N.B. Potential future Canadian, world and Olympic champs will be showing off their talent when the second Canadian Under-18 Boys and Girls Curling Championships get underway in Saint Andrews, N.B. Canadian U-18 championships to be staged in Saint Andrews, N.B. 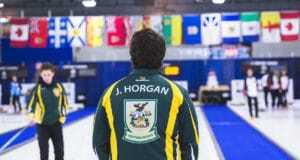 Canada’s top up-and-coming curlers will play for national championships for a second straight year in the province of New Brunswick.